Singapore, 30 April 2009 — Former Samsung Group Chairman Lee Kun-Hee has reclaimed the pole position as the richest Korean, according to the latest South Korea Rich List published by Forbes Asia. Ranked No. 3 last year, Lee topped the list with US$3.9 billion, up from $2.7 billionpreviously as a tax investigation revealed larger shareholdings in Samsung Life Insurance and Samsung Electronics than previously reported. The 67-year old has now held the No. 1 spot in all but one year of the South Korea rich lists since it debuted in 2005. South Korea's richest individuals have lost US$14 billion this past year as the nation's economy shrank in the fourth quarter for the first time in a decade and exports tumbled. Also damaging have been the weak Korean won, which dropped 35% against the US dollar, and the benchmark Kospi index which slipped about 25% in the past 12 months. The 40 wealthiest are now worth $27 billion, down from $41 billion last year.This year, seven tycoons are no longer billionaires, leaving just five holding on to the exclusive status. Among the casualties was former chief executive of copper-mining giant Kazakhmys, Cha Yong-Keu. He lost $1 billion and slipped 20 places to No. 29 with $400 million. Another tycoon who is nearly $1 billion poorer is Hyundai Motor Chairman Chung Mong-Koo. The 71-year old retains his No. 2 position with a revised net worth of $1.85 billion. His brother, last year's richest person, Hyundai Heavy Industries' Chung Mong-Joon suffered a more serious dent in his wealth. The biggest loser this year, his net worth sank by $1.7 billion. The 57-year old Chung is now ranked third and worth $1.3 billion. Only two of last year's tycoons saw a gain in their wealth. Other than ex-Samsung chairman Lee, education tycoon Chang Pyung-Soon added $55 million to his worth, thanks togains in net assets and sales of his Kyowon Group. With $860 million, the 58-year old is now ranked No. 8, up from No. 22 last year. The minimum net worth to make the list this year was just $290 million, down from $510 million. The lower bar helped four individuals who featured in past Forbes Asia richlists to climb back into the ranks after an absence last year. Among the four returnees are online gaming pioneers NCSoft's Kim Tack-Jin, 42, (No. 26, $440 million) and Nexon's Kim Jung-Ju, 41, (No. 36, $320 million). They are two of 11 self-made entrepreneurs on the list. 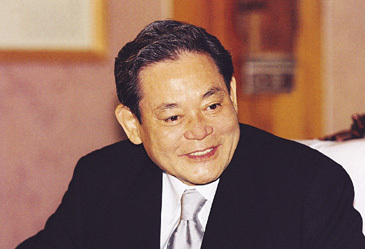 The rest inherited at least part of their wealth, with most having ties to Korea's leading chaebols. Lee Kun-Hee's sister Lee Myung-Hee, head of Shinsegae, is again the richest woman on the list at No. 4 with $1.2 billion. His spouse, Hong Ra-Hee, is also one of the only three women on the list. She is at No. 20 and worth $482 million. The third richest woman is Kim Young-Shik at No. 37, with $310 million. She is the wife of LG Group Chairman Koo Bon-Moo (No. 9, $770 million). The full list of South Korea's richest and accompanying stories can be found in the May 11 issue of Forbes Asia, which is available on newsstands now. Also in this issue, Forbes Asia shines the spotlight on Seo Jung-Jin, 52, Chairman &CEO of Celltrion, Asia's largest contract manufacturer of drugs that are not based on chemicals but on biotechnology. Barely missing the cut-off for the top 40, he is estimated to be worth at least $250 million as Celltrion shares have soared 600% since early last year. Net worths were compiled using disclosed stock holdings of listed companies. For privately held companies, Forbes Asia largely used audited financial statements availablethrough South Korea's Financial Supervisory Service to which we applied comparable market multiples. Stock prices and exchange rates were locked in on April 7. For more information, visit www.forbes.com. Forbes Media encompasses Forbes and Forbes.com, the #1 business site on the Web that reaches 18.6 millionpeople monthly. The company publishes Forbes and Forbes Asia, which together reach a worldwide audience of more than 5.4 million readers. It also publishes ForbesLife and ForbesWoman magazines, in addition to local-language licensee editions in China, Croatia, Israel, Japan, Korea, Poland, Romania, Russia, Turkey and the United Arab Emirates. Other Forbes Media Web sites are: ForbesTraveler.com; Investopedia.com; RealClearPolitics.com; RealClearMarkets.com; RealClearSports.com; and the Forbes.com Business and Finance Blog Network. Together with Forbes.com, these sites reach nearly 40 million business decision makers eachmonth.